Disgruntled Korean War vet Walt Kowalski sets out to reform his neighbor, a young Hmong teenager, who tried to steal Kowalski’s prized possession - his 1972 Gran Torino. BEFORE: Today’s film is special for a few reasons. 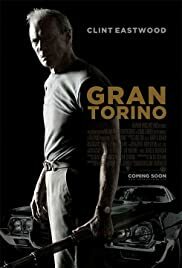 Gran Torino is the first film in this marathon from the 21st century (2008 release). And, it’s starting a chain of Clint Eastwood films. This chain will be focusing on Eastwood’s non-Western films. (There will be a Western chain later in the summer and will feature Mr. Eastwood). Gran Torino is directed by and stars Clint Eastwood. I was going to mention this is the last film Eastwood acted in, but that will no longer be the case come September of this year when Trouble with the Curve is released. AFTER: This film gives a whole new meaning to the phrase, “Get off my lawn.” Walt Kowalski (Eastwood) is the stereotypical grumpy old man who hates everyone and everything. The difference with Walt is that he’s a war veteran who won’t just tell you to get off his lawn, he’ll make you get off his lawn as he points his shotgun in your face and follows up with, “I’ll blow a hole through your head.” I can’t think of anyone who could play this role half as well as Eastwood does. There’s a reason Eastwood is typecast into these roles; he’s good at it. The premise of the film doesn’t seem all that intriguing from the plot description. How entertaining can it be to watch an old veteran try and improve some teenager’s life? As it turns out, quite entertaining. Combine Walt’s one-liners, slurs, and other derogatory remarks with a group of Hmong people he grows to like more than his own family and a gang of Hmong people he wants to beat up, and you have a recipe for success.